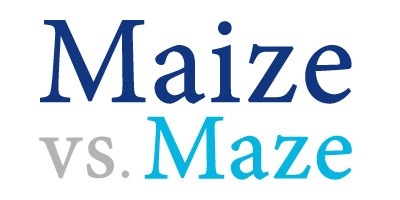 Home » Maize vs. Maze: What’s the Difference? If you were stuck in a confusing task that involved navigating a pathway from one point to another, what would you call it? Would you use the same word that you would use to refer to a widely planted grain crop that originated in Mexico? Initially, it might seem so. But these words, maze and maize, are homophones. They are pronounced similarly, but they mean different things. Maze and maize are never interchangeable, so it’s important not to confuse them. To discover whether you should choose maze or maize in any given situation, continue reading. What is the Difference Between Maize and Maze? In this article, I will compare maize vs. maze. I will use each word in a sentence and demonstrate its proper context. I will also reveal a helpful trick to use when you can’t decide whether to choose maize or maze in your writing. What does maize mean? Maize is a noun. It refers to a tall grain plant, which is also called corn. Maize also refers to a shade of yellow derived from the color of this plant’s kernels when fully ripe. Maize, or corn, was first grown in Mexico roughly 10,000 years ago. Today, it is the most abundant crop in the United States. Its uses include food for humans and animals, biofuels, and the production of artificial food additive products. In the U.S., many children learn that Native Americans offered European settlers maize to help them survive. “Carol, your cardigan is such a lovely shade of maize!” exclaimed Donna. What does maze mean? Maze is also a noun. It refers to a type of puzzle, where the solver must find an unobstructed route from one point to another. A maze typically consists of several branching paths, many of which lead to dead ends, with only one or very few possible unblocked routes that can be followed to successful completion of the puzzle. If the maze has only one, extremely convoluted path, it is sometimes called a labyrinth. The puzzle book contains an entire chapter on mazes. My daughter completed the maze in under 60 seconds. An interesting irony of these two words is that corn itself is called maize, but if you live anywhere in the Midwest, you might be familiar with corn mazes, which are community activities at county fairs or family farms where mazes are created from cornfields. Despite being made of corn, these are still called corn mazes. Here is a helpful trick to remember maze vs. maize. If you are referring to a puzzle that involves following a path between two points, use maze. If you are writing about a tall, grassy plant with edible grains, use maize. Maize and grain are both spelled with an I, so remembering that this word refers to a grain plant should be easy. As mentioned above, in the United States, corn is sometimes planted in a pattern so that when the stalks grow tall, they form the walls of a maze large enough for humans to navigate. Corn mazes are a popular autumn pastime in many regions. Interestingly, since corn is a synonym for maize, these puzzles could also be called maize mazes. To do so would be needlessly confusing, so this usage has never gained popularity. Is it maize or maze? Despite sounding the same when pronounced, these two words have wholly different meanings and are not interchangeable in any way. Maize is a word for a grain crop that is also called corn. A maze is a pathfinding puzzle. Since maize and grain both contain the letter I, remembering that maize refers to a plant should be simple. You can always refer back to this article for further assistance, as well. 1 What is the Difference Between Maize and Maze?